The Rangers play their 38th game of the 2016-17 season tonight, Dec. 29, against the Arizona Coyotes at Gila River Arena (9:00 p.m. ET - TV: MSG Network; Radio: ESPN 98.7 FM). New York has won eight of its last 12 contests (8-4-0), including seven of its last 10 games (7-3-0) and four of its last six games (4-2-0). The Rangers have posted a 24-12-1 record this season. 2016-17: Tomorrow's game is the second of two meetings between the Rangers and Coyotes, and the only meeting between the two teams in Arizona. The Rangers have posted a 1-0-0 record (1-0-0 at home; 0-0-0 on the road), as the Blueshirts defeated the Coyotes, 3-2, on Oct. 23 at MSG. Eight different Rangers recorded a point in the contest and Henrik Lundqvist stopped 27 of 29 shots he faced to earn the win. New York has won each of its last six contests against the Coyotes, dating back to Mar. 24, 2014. The Rangers' active six-game winning streak against the Coyotes is their longest winning streak against the Jets/Coyotes franchise in the Blueshirts' franchise history. New York has tallied three or more goals in each of the six contests, including four or more goals in five games, and has outscored the Coyotes, 24-11, in the six contests. 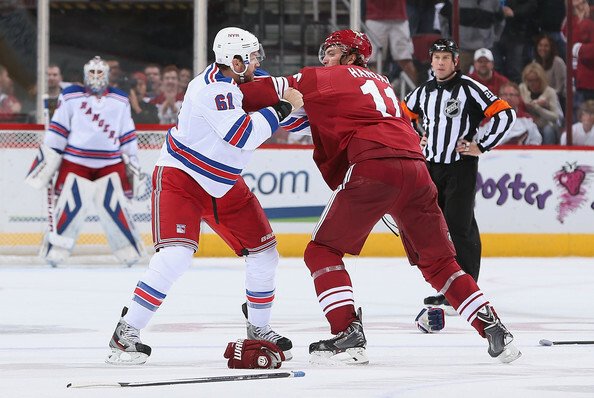 The Rangers have won nine of their last 10 games against the Coyotes, dating back to Dec. 16, 2010 (9-1-0 record). Oscar Lindberg was selected by the Coyotes in the second round (57th overall) of the 2010 NHL Entry Draft. The Rangers acquired Lindberg in a trade with the Coyotes on May 8, 2011. Jim Schoenfeld served as Coyotes Head Coach for two seasons (1997-98 - 1998-99). Benoit Allaire was the Coyotes Goaltending Coach for seven seasons (1997-98 - 2003-04) before joining the Rangers organization. Josh Jooris played part of one season with the Rangers (2016-17). Anthony Duclair played part of one season with the Rangers (2014-15). Jamie McGinn was teammates with Nick Holden for two seasons with Colorado (2013-14 and 2014-15) and with Brandon Pirri for part of one season with Anaheim (2015-16). 90TH SEASON NOTE: Alain Vigneault coached his first game with the Rangers on Oct. 3, 2013 against the Coyotes and earned his 500th career win as an NHL head coach on Feb. 14, 2015 against Arizona. Henrik Lundqvist - 8 GP, 7-1-0, 2.10 GAA, .926 SV% - Lundqvist has earned a win in each of his last three appearances against the Coyotes, and he has allowed two goals or fewer in five of his eight career appearances against Arizona. Antti Raanta - 4 GP, 3-0-1, 1.47 GAA, .957 SV% - Raanta has allowed two goals or fewer in each of his four career appearances against the Coyotes, and has made at least 30 saves in three of the four contests. Rick Nash - 40 GP, 19-17-36 - Nash has tallied 10 points (five goals, five assists) in his last 14 games against the Coyotes. Dan Girardi - 14 GP, 5-4-9 - Girardi has tallied five points (two goals, three assists) in his last six games against the Coyotes. Derek Stepan - 10 GP, 1-6-7 - Stepan has notched a point in six of 10 career games against the Coyotes and has recorded four assists/points in his last five games against Arizona. Chris Kreider - 5 GP, 5-1-6 - Kreider has registered a goal/point in each of his last four games against Arizona (five goals, one assist). Kevin Hayes - 5 GP, 3-2-5 - Hayes has registered a point in four of his five career games against Arizona, and has tallied a goal in two of his last three contests against the Coyotes. Brandon Pirri - 7 GP, 4-1-5 - Pirri has tallied a point in five of seven career games against the Coyotes, including four of the last five games and each of the last three contests. The Rangers' 24 wins in 2016-17 are tied for the third-most wins the team has earned through the first 37 games of one season in franchise history. The Blueshirts have earned at least 24 wins in their first 37 games of a season seven times in franchise history (1941-42, 1970-71, 1971-72, 1991-92, 1993-94, 2011-12, 2016-17), and the only seasons in which the team earned more than 24 wins through the first 37 contests were 1993-94 (26) and 1971-72 (25). New York is tied for the NHL lead in wins this season (tied with Columbus) and is the only NHL team that has earned at least 11 wins both at home and on the road thus far in 2016-17. New York is tied for the NHL lead in road wins this season (11) and leads the NHL in road wins since the start of the 2013-14 season (83). The Blueshirts have earned a win in 10 of their last 14 road contests (10-4-0), including four of their last five road games. The Rangers are the only NHL team that has five players who have registered at least 10 goals this season (Michael Grabner, Rick Nash, Kevin Hayes, Chris Kreider, and Jimmy Vesey). The Blueshirts are also the only NHL team that has 11 players who have recorded 10 or more assists in 2016-17. Rangers defensemen registered six points (two goals, four assists) on Dec. 27 vs. Ottawa, and at least one Blueshirt defenseman recorded a point on each of the team's four goals. The Rangers are one of two NHL teams that have three defensemen who have recorded 16 or more points this season. Nine of the Rangers' last 16 games, including six of the team's last 10 contests, have been decided by one goal. The Blueshirts have won seven of their last nine games which were decided by one goal (7-2-0), including each of the last three games, and the team has posted an 8-5-1 record in games decided by one goal this season. The Rangers have posted a 12-4-0 record against Western Conference teams this season, including a 6-1-0 record against teams in the Pacific Division. New York ranks second in the NHL in goals for (123 - includes two team goals awarded for shootout wins) and ranks third in the NHL in goals per game (3.27) this season. Including team goals awarded for shootout wins, the Rangers have tallied three or more goals in 23 games this season, including four goals in each of the last two games. The Rangers have allowed two goals or fewer in regulation in 24 of 37 games this season and have posted a 20-3-1 record in those 24 contests. The Rangers rank third in the NHL in goal differential this season (plus-31; 123 goals for, 92 goals against). The Chris Kreider-Derek Stepan-Mats Zuccarello line has tallied 13 points (five goals, eight assists) over the last two games. The three players have registered 37 points - including 13 goals - in the Rangers' 13 games since Dec. 1. Mats Zuccarello has tallied the primary assist on each of Chris Kreider's last four goals (dating back to Dec. 11 vs. New Jersey) and the primary assist on each of his last five even strength goals (dating back to Dec. 3 vs. Carolina). In addition, Zuccarello has notched an assist on each of Kreider's last six goals. Henrik Lundqvist enters the contest one win away from passing Dominik Hasek to become the all-time leader in wins by a European-born goaltender in NHL history. Lundqvist is also one win away from passing Hasek for sole possession of 12th place on the NHL's all-time wins list. Lundqvist's next appearance will be his 711th career appearance with the Rangers, and he will tie Olaf Kolzig for the fourth-most appearances by a goaltender with one franchise in NHL history. Antti Raanta has posted a 9-3-0 record, along with a 2.11 GAA, a .930 SV%, and 2 SO in 13 starts this season. In addition, Raanta has allowed two goals or fewer in 10 of his 13 starts in 2016-17. Ryan McDonagh established a single-game career-high with three assists and tied a single-game career-high with three points on Dec. 27 vs. Ottawa. He leads the Rangers in assists (21) and leads team defensemen in assists and points (23) in 2016-17. McDonagh is the first Ranger who has tallied at least 21 assists in the first 37 games of a season since Marian Gaborik and Vinny Prospal in 2009-10, and he is the first Rangers defenseman who has recorded at least 21 assists in the first 37 games of a season since Tom Poti in 2002-03. In 71 regular season games during the 2016 calendar year, McDonagh has registered 40 points (six goals, 34 assists) and a plus-26 rating. McDonagh is tied for second among NHL defensemen in games with an assist this season (17), and he is one of four NHL defensemen who have registered an assist in at least 17 games in 2016-17 (Erik Karlsson - 18; Victor Hedman - 17; Duncan Keith - 17). In addition, the Rangers captain ranks second among NHL defensemen in even strength assists (15), is tied for second in primary assists (12), is tied for fourth in assists (21), and is tied for fifth in even strength points (16) this season. Derek Stepan leads the Rangers in points (28) and primary assists (13) this season. He enters the contest with a four-game point streak (four goals, three assists), and he has posted a multi-point game in each of the last two contests (three goals, two assists over the last two games). In addition, Stepan has recorded 17 points (seven goals, 10 assists) in the last 19 games, including 14 points (five goals, nine assists) in the last 13 contests. Stepan has registered a point on six of the Rangers' last nine goals, dating back to Dec. 20 at Pittsburgh. Chris Kreider leads the Rangers in multi-point games this season (seven). He has tallied 12 points (seven goals, five assists) in the last 13 games, and he is tied for sixth in the NHL in goals since Dec. 1. Mats Zuccarello enters the contest with a four-game assist/point streak (six assists), and he has tallied four primary assists over the last two games. In addition, he has registered 11 points (one goal, 10 assists) in the last 12 games. Since the start of the 2013-14 season, 155 of Zuccarello's 195 points have either been a goal or a primary assist. Nick Holden tied a single-game career-high with two goals on Dec. 27 vs. Ottawa, and he leads Rangers defensemen in goals this season (six). He is tied for fifth among NHL defensemen in even strength points (16) and is tied for 10th among NHL defensemen in even strength goals (five) in 2016-17. The Rangers are one of three NHL teams that have a 20.0% power play efficiency and an 84.0% penalty kill efficiency or better in 2016-17. New York has outscored its opponent on special teams in 16 games this season and has posted a 13-3-0 record in those contests. The Rangers were 1-for-4 (6:06) on Dec. 27 vs. Ottawa. The Blueshirts rank 10th in the NHL in power play efficiency this season (20.2%; 22-for-109). The Rangers were 4-for-4 (8:00) on Dec. 27 vs. Ottawa. The Blueshirts rank eighth in the NHL in penalty kill efficiency this season (84.2%; 85-for-101). The Rangers have not allowed a power play goal against in seven of the last 10 games and in 18 of the last 26 games. The Blueshirts have killed off 62 of their opponents' last 72 power play opportunities, dating back to Nov. 3 (86.1%). New York is tied for second in the NHL in shorthanded goals in 2016-17 (five). Dec. 29, 1974 - Brad Park tallied his 346th career point as a Ranger, passing Harry Howell to become the franchise's all-time leader in points by a defenseman (at the time). Park held the franchise record for career points by a defenseman until Ron Greschner passed him during the 1981-82 season. Dec. 29, 2007 - The Blueshirts registered five power play goals in a 6-1 win against the Toronto Maple Leafs. Miller still being demoted, not on a line with Hayes despite their obvious chemistry. Holden having another good game. Kreider scores the third goal for the Rangers. Crappy pizza time. Maybe in AZ they think that stuff is good, but not here in NY. Stepan's passing is ridiculous good tonight. Miller sets up Fast in front and Fast, predictably, doesn't even get his stick on it. Got muscled off by the Dman. Miller sets up Hayes for a partial break while on the PK. Draws a penalty, eliminates the Yotes PP. But AV sees no reason to play Miller and Hayes together at even strength. Duclair undresses Skjei, and Girardi and the famous poke check helps deflect it past Raanta. Fast on ice for another goal against. But he's nifty and all. Kreider runs over Murphy. About time somebody sent that guy a message. Good job, Kreider. Location: Katz Deli....I wish PV rolling tonight!!!! Raanta saving the Rangers in the third period so far. Rangers in danger of blowing a 2 goal lead to the lowly Desert Puppies. The kids are in bed, the wife is upstairs, the Rangers are on and I have some Clyde Mays Special Reserve. Yotes tie it. Girardi and Fast allow the ultimate goal scorer to skate right to the doorstep and score. But Miller will get benched and these two meatsacks will get more ice time. Looking for Stepan to bail out the Rangers again, setting up or scoring the winning goal. Hanzal with an unbelievably stupid penalty, the Pimple deflects a McDonagh shot in. Pimple with two goals in this one. Trade him now while his value is as high as it's gonna get. AV must've been distracted. Miller was out there with Hayes and, go figure, Hayes sets up Miller for an empty netter. Smith goes ballistic as Pimple scores a hat trick with 16 seconds left. Pimple will be in the lineup for the rest of the season, based on a three-goal game against a team made up of 19 year olds and AHL'ers. A win is a win. This Rangers team at least has a functional power play that can score, especially when the opponent is passive on the PK. Loved all the commentary PV. Agree on pretty much everything said. Notice Gerardi with a big hand in all 3 Coyotes goals? I don't think Fast is as bad as you make him out to be but he's even farther from how good AV thinks. Well, the truth is always somewhere in the middle. For some reason Fast reminds me of Mikko Leinonen, and I hated that guy too.